Weekend binge drinking plans burning a hole in your pocket? There’s a new bar in town that’s gonna help you unwind with all your favourite labels, without being too pricey. Unlimited has recently opened up in the heart of the city i.e. Connaught Place, and they do not differentiate based on your choice of poison. Whether you want to sip on cosmos all evening or want to grab a couple of beers after with your colleagues, this place has got deals to help you #BreakFree. All you gotta do is avail it within 3 hours of your first order. With Unlimited liquor packages starting at INR 799 (+taxes), keep reading to know our top picks. Calling all whisky aficionados. Here’s another reason to drink your night away to glory with this golden elixir. Order it neat or on the rocks, and as much as you’d like within a span of 3 hours because they have an irresistible offer for unlimited Black Dog whiskey at INR 899 (+taxes). They’ve also got unlimited Red Label for INR 1299 (+ taxes) - which we think that speaks for itself. Plus, the Indian palate has a well-known preference for scotch, probably because it goes well with our favourite tandoors & desi snacks. And at these prices, it’s pretty much a steal deal. Painting the town red with your girls? Make your gossip sessions so much more interesting with unlimited cocktails for INR 899 (+ taxes). 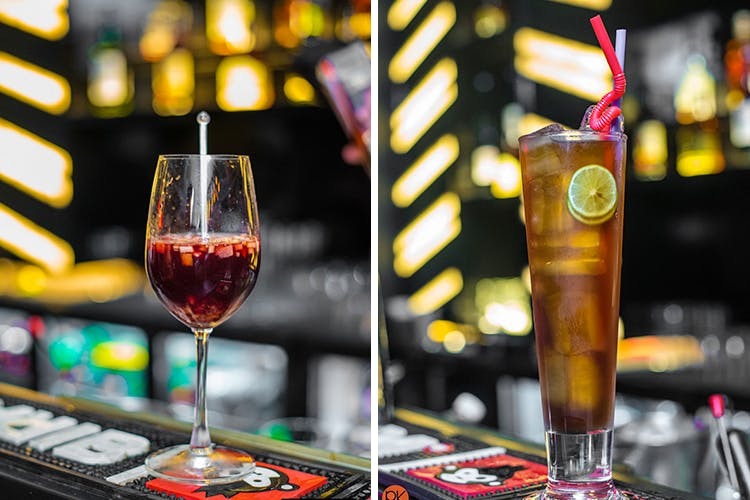 Mix & match between your favourites like margaritas, cosmopolitans, daiquiris (and more) or LIITS for something a bit more potent & gear up for a crazy night. Beer lovers, this is one deal you won’t be able to resist. Ever since Bira has has entered the market, they have managed to win over our hearts. And it’s never enough. Whether it’s football season or just a meet-up with old buddies, Bira has become a popular choice!So we were pretty stoked on hearing that these folks are offering unlimited Bira for INR 1099 only (+ taxes). Party animals, bookmark this place for your next plan. Let loose without going too heavy on your wallets because they’ve got unlimited Smirnoff for INR 799 only. We know where we are going for our next alcoholic escapade! With all day unlimited deals all around the year, this place has pretty much won over our hearts. And it doesn’t end here, they have a got a whole lot more in their kitty that you've gotta check out. They’ve got a rustic ambience with a hint of fine dining to make your entire experience wholesome. With a menu full of your favourite munchies & dishes, they’ve got options to fill you up in order to avoid a massive hangover the next morning. So head here with your squad to really get the most out of their deals.